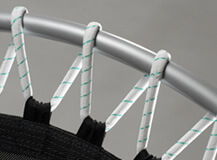 Same technology as on Trimilin-swing but using less space. 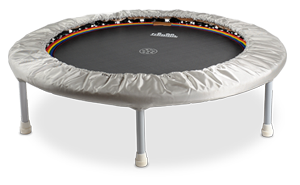 The smaller diameter of only 1 meter provides a tighter suspension than the Trimilin-swing rebounder with its diameter of 120 cm. 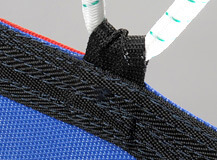 Therefore it swings sufficiently fast to support a normal jogging frequency, while the special rubber cable is just a bit softer than the springs of Trimilin-med. 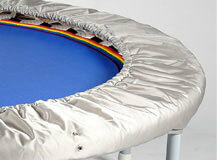 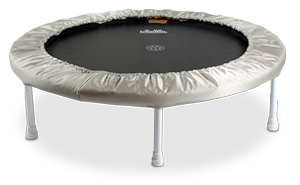 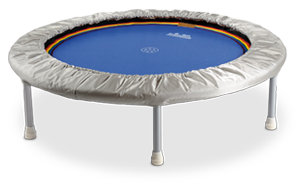 The high-elastic mats of the Trimilin trampolines are multiple stitched with special thread.